Rangers have today confirmed the latest season ticket total has now reached almost 32,000, compounding the sense of rebirth that is surrounding the Club. With a near-sellout expected for Friday’s visit of St Mirren (current estimates are around 46,000 seats have been taken) on top, it is safe to say Rangers fans are returning to Ibrox in droves following a difficult spell of board conflict, fan division and general pessimism over the Club’s direction. 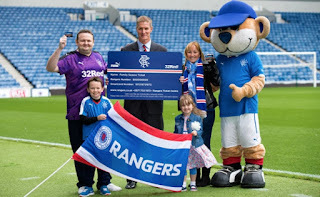 We only have to recall the ‘controversy’ that surrounded the mere mention of investing in an Ibrox season ticket in summer 2014 to now be able to cherish the state of affairs where supporters no longer appear worried about the simple act of backing the team they love. And with season ticket numbers now reaching the normal levels which were previously expected, it is safe to say there is something of a renaissance within the Light Blue Family. "Nearly 32,000 supporters have so far purchased season tickets." By January 2013 Rangers fans had snapped up almost 38,000 season tickets for that campaign, but that number reduced to the 20s thereafter and it is a welcome sight to see them being restored to where they belong. "We're coming down the road. The stench of fear from the midden is palpable. Rangers Football Club, still the greatest club of them all. The new management team have the fans right behind them. The team will be left in no doubt, that we will support them all the way. Any set backs will find us undaunted. We are the people, and we will prevail. On the Scott Allan saga. Rangers know that Hibs can't sell him now. Not after Stubbs' mouthing off to the press. Rangers should keep the pot boiling though. Another two bids or so before the window closes will keep the tensions up at Easter Road. If Scott's form flattens a bit, the Hibs fans will turn on him. Dressing room morale will be hit hard. Eventually, Scott will be in the Hibs reserves. This will be almost as good as Rangers signing him. So Rangers should keep the pressure up. Scott will understand that. He himself will know he won't be coming until next year and will have accepted that. Rangers want Scott Allan, but we don't 'need' him, this season. Next year will be fine. For free as well. Excellent. Hibs, on the other hand, do need the player. They need him badly. However, there is no way that this will work out well for Hibs. This season or in the future. They will rue this idiotic decision not to take the money and use it to strengthen their squad. Come January, I expect Rangers to be well in front in the League and competing in the Cups. Scott Allan will sign his pre-contract with Rangers, Hibs will be struggling to maintain a playoff spot. At the season's end, Rangers will have won the league and promotion. Perhaps even a Cup or two. Scott Allan will depart Easter Road for Ibrox. No fee required. Hibs, if they make the playoffs, will fail to win promotion. Their squad and fans will be gutted. The folly of rejecting Rangers offer, and not strengthening enough, will be all too clear to the Hibs fans. Their club will pay a heavy price for Stubbs' bravado. As for Rangers Football Club? Onward and upward. With an expected crowd for Friday night's game with St Mirren of around 46,000 seats and 32,000 season tickets sold already it means that 14,000 non season ticket holders have been sold in advance. If games are played at our beloved Ibrox on a Saturday at 3pm, we can probably expect another 10,000 - 15,000 seats in advance depending on who we are playing to give us an average gate of between 42,000 and 47,000. That would be a magnificent crowd for the Championship league and would probably be the highest gates in Scotland including the team that play in the east end of Glasgow. It also means that Rangers fans are returning to Ibrox in their droves following a really difficult spell with the last incompetent board. We also had a huge fan division, plus the team were absolutely awful to watch under the management of Ally McCoist. This was caused by a team devoid of tactics and without even the basic fitness to beat some of the part time teams in the league. This year we will be watching a young fit team with the potential to run away with the Championship, if they continue to make the progress we all think they are capable of under our fabulous management team of Mark Warburton and Davie Weir. I would also like to congratulate our new board for having the wisdom to employ W & W in the first place. We are, definitively, the people.